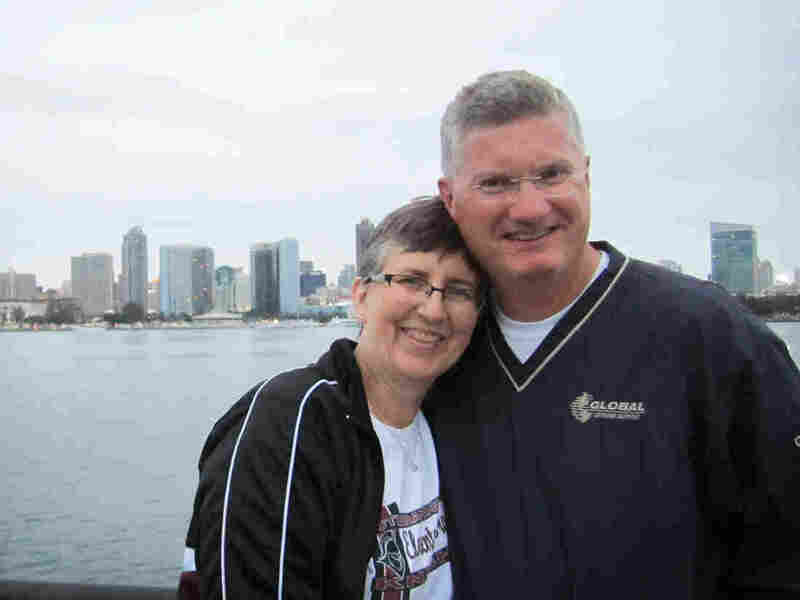 Stroke Procedure Results In Miraculous Recovery For Some Patients : Shots - Health News About 800,000 people have strokes each year in the U.S. Most are caused by clots that block blood to the brain. 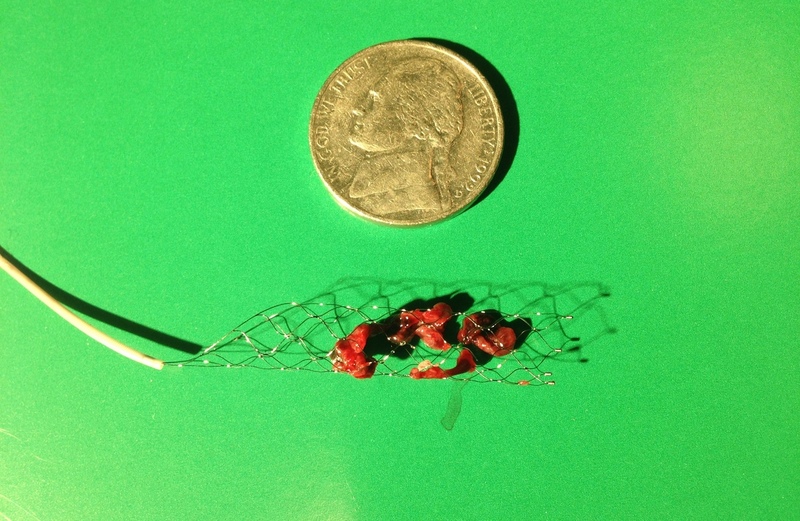 In some cases, doctors can remove the clot using a device that looks like a fishing net. Kurt Hinrichs and his wife Alice in 2015, less than a year after Kurt had a stroke. He recovered after doctors removed the clot that was blocking blood from flowing to part of his brain. On July 17, 2014 Kurt Hinrichs, of Gladstone, Mo., went to bed early. As often happens, he woke in the middle of the night. When he tried to get out of bed, he crashed to the floor, which woke his wife, Alice. "At first it was like, 'What's going on?' " Alice says. "Are you dreaming? Are you sleepwalking?" Kurt wasn't responding to anything Alice asked him, so she called 911. "I [was] thinking, 'this is a nightmare,' " Kurt says. By the time the ambulance arrived, just a few minutes later, Kurt wasn't speaking and his entire right side was paralyzed. Paramedics recognized that Kurt was having a stroke. When they wheeled Kurt out of the house, Alice thought he might never come home again. And if he did, he would be bedridden or in a wheelchair. "I really didn't have a lot of hope that my husband would be normal again, ever," she says. Speeding towards St. Luke's Hospital in Kansas City, Mo., Kurt realized this was no nightmare. He was awake, "but there was something major and massively wrong with me," Kurt says. 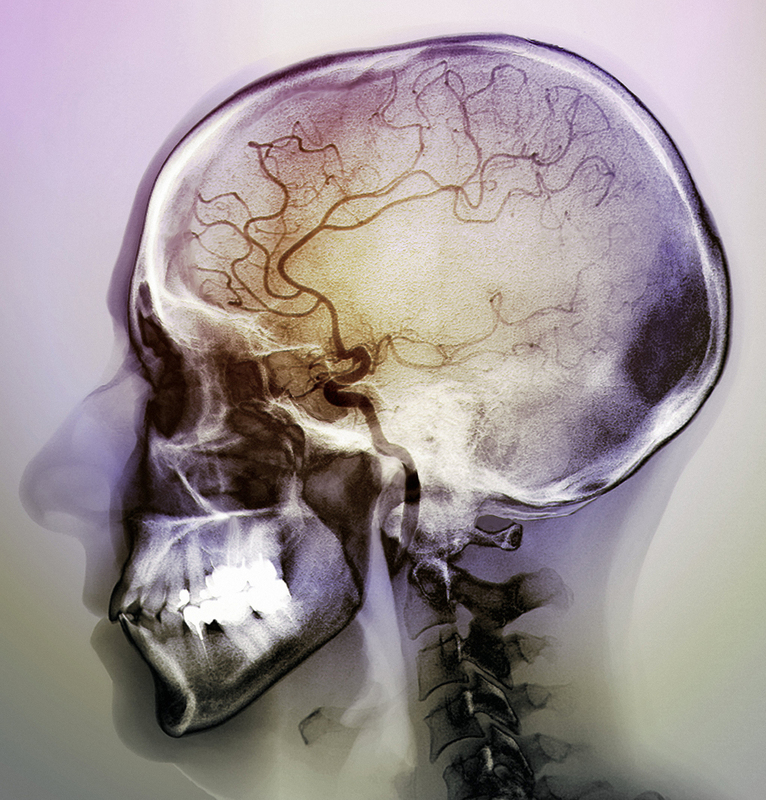 About 800,000 people suffer strokes every year in the U.S. Most of them are ischemic strokes, caused by a clot which blocks a vessel supplying blood to the brain. If blood can't reach the brain, cells are deprived of oxygen and start to die. During an ischemic stroke, blocked arteries cause a lack of blood flow to parts of the brain, seen here in a 48-year-old patient. There are fewer blood vessels visible in the center of the brain. Whatever region of the brain is affected, the part of the body that it controls will cease to work properly, says Dr. Brett Cucchiara, an associate professor of neurology at the Hospital of the University of Pennsylvania. "You may become paralyzed on one side of the body. You may have the inability to speak or understand, you may lose vision," says Cucchiara. And, although doctors have known about strokes for a long time, it wasn't until relatively recently that they could do anything to help patients who are in the midst of a stroke. In 1996, the Food and Drug Administration approved the clot-busting drug tPA to treat ischemic strokes. It's given intravenously and must be administered within three hours of the first symptoms. But tPA works for just a minority of patients. And stroke is the fifth leading cause of death in the country, according to the American Heart Association/American Stroke Association. At St. Luke's Hospital, doctors gave Hinrichs tPA, the clot-busting medicine, but the drug wasn't working. That's when nurses approached Alice and asked if the doctors could perform a new kind of procedure on her husband. It's called a mechanical thrombectomy. Alice had never heard of it, but she agreed. "They got me on the table. And the last thing that I remembered was a huge bank of screens coming over me, and I'm thinking, 'What is that for?' " Kurt recalls. "And I was out." Over the next 20 minutes, doctors inserted a catheter into the femoral artery, in his groin. They wove the catheter up into his aorta, the main artery in the body, then into a carotid artery, which takes blood into the head and neck. Finally they got to the brain vessel where the clot was located. "Once it gets into the brain, that's where it becomes a little trickier," says Cucchiara. "Because the arteries make a lot of sharp turns and curves and become very small and somewhat delicate." Those huge banks of screens help doctors see where they are going as they steer the catheter toward the clot. Inside the catheter is a small piece of equipment that looks like a very thin fishing net on the end of a metal wire. Once they reach the clot, doctors deploy the instrument and catch the blood clot in the net. Once it's trapped, the net, with clot in tow, is pulled back out of the body. "[It's] somewhat analogous to a plumber who comes and uses the plumbing snake to pull a clog out of your drain," Cucchiara says. 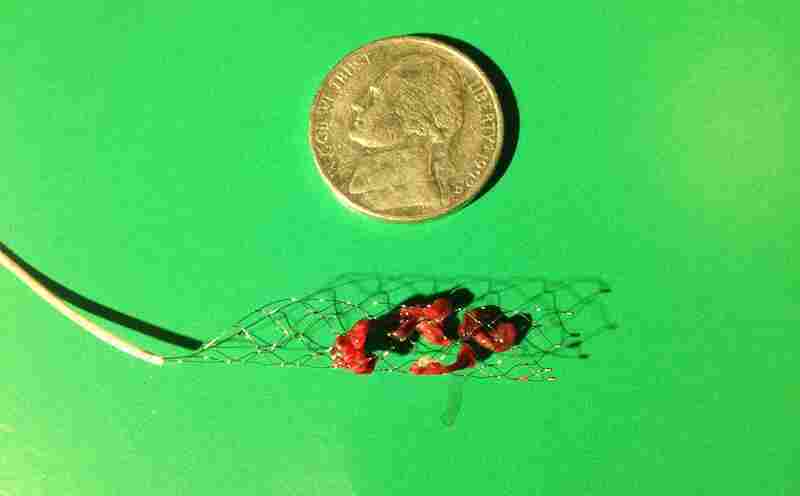 The clot doctors pulled out of Kurt Hinrichs' brain, pictured here still in the device used to perform a mechanical thrombectomy. If the intervention is successful, blood flow is immediately restored to the brain. Within 10 or 15 minutes, the paralysis starts to melt away and, "their ability to speak will completely return," explains Cucchiara. "So it can be quite a remarkable, almost miraculous recovery that you can see right in front of you." After Hinrichs had the procedure, he was able to start wiggling his right arm and leg. His speech returned soon after. His wife had gone home to tell their three children what was happening. When she returned to the hospital about four hours later and entered her husband's room, he asked her in a clear voice, "How is your morning?" "I just kind of stopped and looked behind me and I looked at him," Alice says. "It was absolutely amazing." Hinrichs is what doctors sometimes call a Lazarus patient, after the saint who was restored to life after he died. A massive stroke like the one he suffered can kill patients, or leave them paralyzed and non-communicative. But after the intervention, he walked out of the hospital without any serious, lasting effects. In 2015, after several studies demonstrated how effective mechanical thrombectomy is for certain stroke patients, the American Heart Association/American Stroke Association issued new guidelines making it part of their recommended standard medical care. But not all patients who could benefit from the procedure are getting it, says Guillermo Linares, director of neuro-interventional services at Temple University Hospital. The biggest issue is timing. Both the clot busting medication and a mechanical thrombectomy are a race against time, because they need to be administered within hours of the stroke. That means many pieces need to fall into place very quickly. People need to call 911 the moment they see someone with symptoms of a stroke, the ambulance needs to arrive quickly and paramedics must get the patient to a comprehensive stroke center, Linares says. Some hospitals specialize in rapid stroke treatment and are certified under the Joint Commission, an independent organization. (This website can help locate stroke centers near you.) But many patients, especially in rural areas, do not have easy access to these facilities. "The delivery of the therapy in hospitals is relatively easy when you compare it to what is needed in society at large in order for this therapy to be available," Linares says. Ultimately, emergency medical teams are left to make difficult decisions about how to handle stroke patients. "As soon as emergency medical services get to you, should they drive you to the closest possible hospital, or should they drive past a smaller hospital in order to get you to a larger, comprehensive stroke center where more options may be available?" Linares says. "There's risks and benefits to either path." Some cities, such as San Francisco, have put out guidelines directing paramedics to follow one path or another. Others, such as Cleveland, are tweaking existing protocols or are in the process of writing and testing new rules. Linares says health care providers went through a similar process to develop systems for other major emergency issues, such as heart attacks. Figuring our a clear, organized method to get patients help quickly will be one of the next major advances in stroke care. This story comes to us from WHYY's health podcast The Pulse.